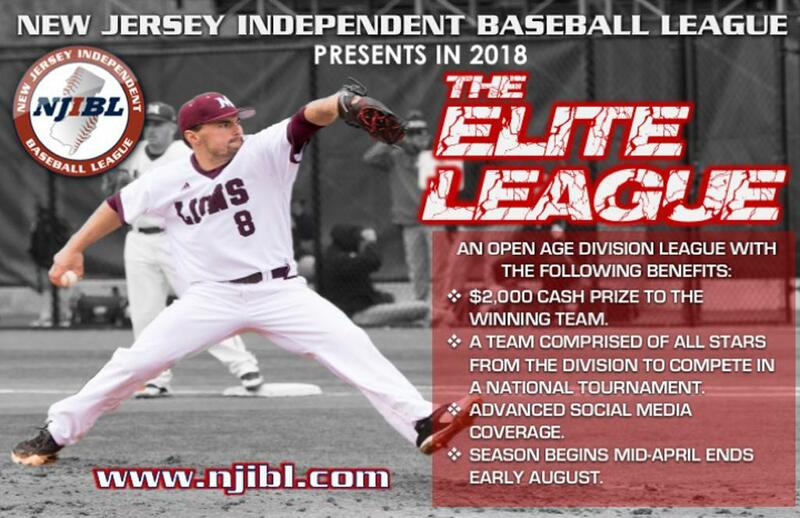 After years of kicking the idea around with some of the coaches and players of teams in the local leagues in the area, the NJIBL will launch an Elite League. As the NJIBL has drawn the best players and competition in Southern NJ and Greater Philadelphia for the past decade, it only makes sense that the best teams at any age level be stacked up against each other. The NJIBL had 32 teams between the 18 and 25 divisions in 2017. There are several outstanding teams and players in this group. Teams from the surrounding leagues will be invited to throw their hats in the ring to vie for the championship of champions. The season will start in the middle of April through the middle of July. This league will play a 17 game schedule with 4 doubleheaders. There is no age restriction above 18 years old. The championship team will receive a $2,000 cash prize and championship trophy on the day of the game. At the end of the season the managers will choose an All Elite League Team. This group of players will represent the league in a regional mens tournament. They will wear personalized jerseys and hats depicting the league logo. In order for a team to have a player eligible to play, the team he plays for must keep up to date stats and must not forfeit during the season. More information will be presented at the league meeting on January 20th at Throwbacks Bar & Grill in Delran NJ at 10:00 am. If you have any questions please contact Gary Shears at (609)314-3603 or email at garyshearsnjibl@gmail.com.